Not caving into the recent trend of looking to Japan for inspiration for Tang Dynasty aesthetics is a focus of the drama, how well do the first stills do? Aiming to be a panorama of early Tang dynasty life, the latest Yu Zheng-produced drama features merchants, pirates, the military, and princes finding love and success in the early Tang dynasty. Based on the script by author Fengnong, A Promenade through the Tang Dynasty 大唐女儿行 (lit: Promenade of Women in the Tang Dynasty) began filming earlier this month with a young cast consisting of Xu Kai (The Legends) , Li Yitong (Bloody Romance), Tan Jianci (Secrets of the Three Kingdoms) , Fan Shiqi (Where the Lost Ones Go), Wu Jiayi ( Untouchable Lovers), and Jiang Mengjie (Sword Master) . The series has already been brought by Hong Kong channel TVB. 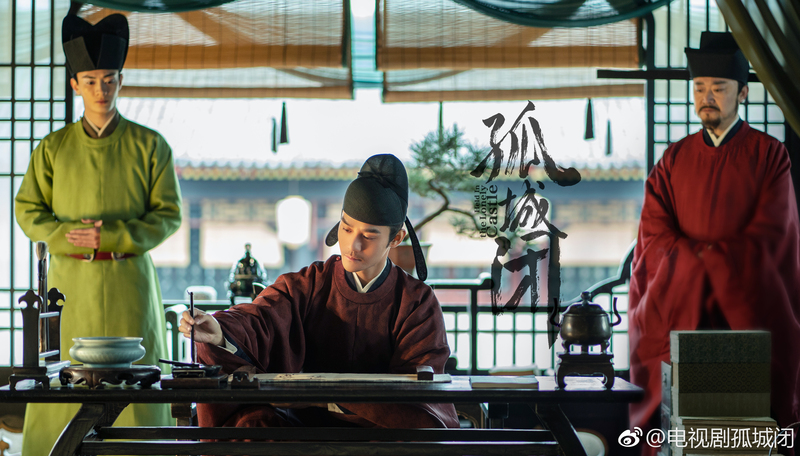 Xu Kai plays Cheng Chumo, the son of Cheng Yaojin and a profligate youth who chooses to make a name for himself after falling in love with Fu Rou (Li Yitong). While he goes to fight pirates in the open waters, Fu Rou leaves behind her merchant family to become a master weaver in the palace. There, she meets Prince Li Ke (Tan Jianci) and Marines General Yan Zifang and becomes entangled in the fight for the Crowned Prince. Fan Shiqi plays Cheng Chumo’s brother while Wu Jiayi plays his love interest, the Princess Qinghe. Ma Yue and Miao Pu play the Emperor Li Shimin and the Empress Zhangsun. Together, the protagonists must fight on all fronts to save their families and the future of the Tang Dynasty. Jiang Mengjie has the face of a Tang dynasty woman from a mural or a sculpture. One potential selling point for the drama is that Yu Zheng hopes to recreate Tang dynasty aesthetics through murals, paintings, and artifacts without looking to Japan for inspiration like so many dramas now do (ex: this look for The Empress of China, the entire feel of Legend of Demon Cat, and the male costumes of The Rise of the Phoenixes) . We’ll see if Yu Zheng keeps his word. Based on the photos released today, the overall hairstyle, colors, and styles of the outfits look promising, but some of the patterns are really weird. The series was previously known as The Taming of a Tiger 驯夫记, Guide to the Glory of the Tang 盛唐攻略, and The Tiger Doesn’t Go Down the Mountain 老虎不下山 . I invite you to zoom in on the main lady’s dress to see the weird patches on her sleeves that look like Tang-dynasty tiles rather than clothing patterns. The shoes are surprisingly accurate, though! The decor in this looks like a Song-dynasty office per Held in the Lonely Castle. Tan Jianci’s outfit is so far my favorite of the bunch. It’s historically accurate, looks expensive, and is pretty. The colors for this, notably the shades of orange and blue/green, are all pretty accurate for the Tang dynasty given dyes available at the time. Her hairstyle is also great. This entry was posted in Drama, Mainland China and tagged A Promenade through the Tang Dynasty, Fan Shiqi, Fengnong, Jiang Mengjie, Li Yitong, Ma Yue, Miao Pu, Tan Jianci, Wu Jiayi, Xu Kai, Yu Zheng by idarklight. Bookmark the permalink. Longest Night in Chang’an uses some more Tang Dynasty makeup. I don’t think I can really handle Tang Dynasty makeup yet, though. Reminds me too much of ghosts in old Hong Kong horror films. Li Yitong doesn’t have the Tang Dynasty look women had back then. Heck, none C-actresses do today with their surgery enhanced v-shaped faces. The aesthetics look nice tough. rather ironic to claim Chinese film makers look to Japan for Tang Dynasty inspiration. Historically, Japanese aesthetics and fashion mimicked ancient China’s. Yeah…I’m pretty irked by that comment in the article…that’s a pretty historically inaccurate statement to make. Anyway I’m excited for this. Xukai seems to have a knack for picking food drama plots so we’ll see! Yu Zheng is a trend-follower and likes to please. He wouldn’t have made the claim that he wants to avoid Japanese influences if enough people didn’t complain about how historically inaccurate and lazy it was to use Japanese elements in Tang dynasty dramas. While many elements that people assume are Japanese are actually borrowed from China (ex. matcha, sashimi, similarities in hanfu/kimono), Japanese aesthetics have also developed many elements unique to Japan. Their entertainment industry also has been very influential throughout the world, so it’s not surprising that artists look to them for inspiration. For example, Fan Bingbing’s head ornaments in the link in the post are only found in Japan and would not be found in ancient China. Boxy shoulders found in male costumes of The Rise of the Phoenixes is another costume detail unique to Japan that has became common in Tang dynasty dramas. For a more direct example where you can trace the Japanese influences, just look to Chen Man, the most well-known photographer in China. Her Ming-dynasty wuxia themed photoshoot for Ni Ni uses two kimonos by Japanese designers and is shot at a temple in Kyoto. And that photoshoot actually looks mostly Chinese. There are others by her I remember looking at and purposely chose not to post because of how Japanese they looked (ex. the “Tang dynasty” photoshoots she did for The Legend of the Demon Cat). So now it seems history is revised with Japan as the true historical cultural influencer of east Asia, and China merely copied and owes all to its neighbor. Plus, it’s not like only Japanese has influences in Chinese dramas. There are also many with Western, Korean, even Indian influences. Cultural exchange is inevitable when you’re not living in a vacuum. The Tang Dynasty itself even had strong foreign influences, as seen by Xu Kai’s first outfit above the cut, a common Tang Dynasty style with strong Persian influences. You do realize the person you’re replying to is making an ironic statement right?.. “copying” ? Look, China might have a bad reputation today for cheap stuff, poltiicis or whatnot but you can’t just discredit the massive historical influence China once had on its neighbors. It’s more like some Koreans, Viet and Japanese try tend to deny it. The rhetoric nowadays is ridiculous isn’t it. Everything people do nowadays is ‘copying’ but everything nations did back then was merely ‘drawing inspiration’. Excuse me while I roll my eyes to the back of my head. China does indeed look to Japan for historical elements because China lost much of its own history due to the purge during the cultural revolution. But that culture was preserved in Japan so there’s actually a saying that if you want to see Tang architecture then go to Japan. However what I have a problem with is the tendency to associate ALL and ANY unfamiliar elements of Tang with Japanese influence and that’s simply untrue. I just want to point out that modern day kimonos are also not exact replicas of what they were in old Japan (ie the kimonos in the Nini photo shoot you’re referring to are modern designs) yet we accept all of these new designs as uniquely Japanese. Kindly extend Chinese hanfu the same courtesy. Just because they’re not exact replicas does not mean that they are not Chinese in nature. Chen Man is a young contemporary photographer, her work includes modern interpretations of Chinese culture incorporating certain Chinese elements, but she is not obligated to adhere to exact historical measurements. To accept self expression from Japanese artists and not from Chinese artists is quite contradictory isn’t it? It’s perfectly fine and normal for foreign influences. I was just responding to the idea that just because Japan used to be inspired by China, China can’t also look to Japan for design ideas. Like I said, Japanese culture is influential throughout the world, so it’s not surprising that artists look to them for inspiration. Chinese people has a rich enough culture that we should be comfortable with admitting that we borrow from others, too. I also don’t have an issue with Chen Man. I was just using her as an example to point out traceable Japanese influences in Chinese artists’ reimagining of ancient China. I love most of her stuff, but I do avoid some of her mostly Japan-inspired Tang Dynasty photoshoots since I don’t want to repeat the falsehood that Tang dynasty China looks like Japan. Another thing is that the Japan preserved the Tang Dynasty thing is just a rumor. Female traditional Japanese hairstyles are actually inspired by the late Ming dynasty. Common geisha and oirin looks also takes their inspirations from late Ming/ early Qing dynasties. Japanese architecture doesn’t even have the same foundational frame as Tang Dynasty architecture. That’s why it’s lazy and disingenuous for designers to take elements from Japanese designs and then claim they’re being historically accurate Tang elements . It’s extra annoying when the drama producers repeat that rumor as justification. have you seen statues of the Tang Dynasty ‘fat’ ladies? Their hairdos were copied by Japanese ladies during a time when 14 missions from Japan sailed across the sea to learn everything Tang China had to offer. Western history books and credible Japanese historians have stated that Nara and Kyoto were modeled after Chang’an. Sorry to say, but your discredit of Tang influence on Japan falls in line with Japanese nationalists’ version of history. I’d like to see weaving!